Find your chill state of mind on a vacation you and your family won’t soon forget at Margaritaville Resort Orlando opening early 2019! Enjoy savings of up to 50%* off at Margaritaville Hotel at Margaritaville Resort Orlando! That’s 50% off rates for select suites, 35% off rates for all lagoon view King and Queen rooms. Guests must book their trip between November 21-27, 2018 and travel between January 15-March 31, 2019. *No minimum night stay. Deposit equivalent to first night room and tax. Must cancel 7 days prior to arrival. Excludes the Jimmy Buffett Suite. Other restrictions may apply. Rate Code: FLASH. The Margaritaville Hollywood Beach Resort is the perfect setting for guests to escape the everyday and just chill. Located on the legendary Hollywood Beach Broadwalk, the resort has an extensive array of amenities including 8 restaurants and bars, an award-winning St. Somewhere Spa and FREE live entertainment seven nights a week complimented by a high level of hospitality, service and attention to detail. Enjoy up to 30% off* guest rooms and suites for stays through April 30, 2019. *Offer valid November 23-26, 2018 for stays through April 30, 2019, some blackout dates apply. Minimum 2-night stay required. Ready, set, save up to 50% off guest rooms on your upcoming winter getaway now through November 26 at Margaritaville Resort Grand Cayman. Enjoy a sun-kissed vacation and experience newly renovated rooms, live entertainment, multiple restaurants, 4 swimming pools, and our private beach. *Offer is valid for new bookings only with travel dates December 21, 2018 – April 11, 2019. Cannot be combined with any other offer. Blackout dates may apply. Rates quoted in USD and attract government tax, service charge, and resort fees. Sale starts 12:00am ET November 21, 2018 and ends 11:59pm ET November 26, 2018. From beach-inspired apparel, coastal casual home décor, and, of course, flip-flops, the Margaritaville Store is your one-stop shop. Get $25 off for every $75 you spend* for our Come Monday Cyber Monday sale going on now through 11/26/18. Use Code: CYBER25 to save and take advantage of free shipping* sitewide! *$25 off for every $75 spent offer valid through 11/26/18 at 11:59pm PST. Discount cannot be applied towards taxes or shipping and handling charges. Shipping charges are calculated after discount. Free shipping offer includes all items unless otherwise noted in product description. Free offer applies to purchases of $100 or more, domestic, UPS SurePost shipping only and is not valid on international orders. Free shipping offer ends 11/26/18. 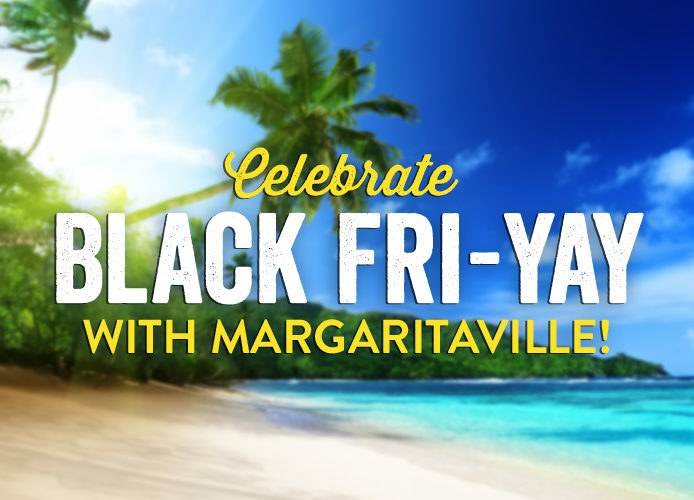 Our retail store locations, located at Jimmy Buffett’s Margaritaville Restaurants and LandShark Bar & Grill locations all over, are offering some special store savings* for Black Friday. If you are near a location, be sure to check them out! *Excludes discounted items, valid only on Black Friday weekend (11/23-11/25/18), during regular store hours. Valid in-store only at participating Margaritaville Restaurant locations including Atlantic City, Chicago, Cleveland, Destin, Key West, Las Vegas, Mall of America, Mohegan Sun, Myrtle Beach, Nashville, Panama City Beach, Pigeon Forge, San Antonio, Syracuse, and participating LandShark Bar & Grill locations including Atlantic City, Daytona Beach, and Myrtle Beach. Travel back to 1998 with a classic Jimmy Buffett concert recorded in Charlotte, NC. Hear it this Saturday at 7am ET & Sunday at 3p ET on Radio Margaritaville, SiriusXM CH 24. As a holiday bonus, you can listen FREE to SiriusXM now through November 26 on inactive satellite radios* and streaming. *Some older Sirius satellite radios may not be capable of receiving the free listening channels.